This was the biggest question that kept popping up when I was planning my Greece trip. After being born and raised in a city which has one of the world’s largest beaches, (Marina in Madras/Chennai, India) I was skeptical to spend time in more than one beach/island city in Greece. However, I was completely wrong. In the recent past, my beach/island exposures apart from Chennai have been Goa, Andaman, Bintan, Vancouver etc., but I have not seen anything like this. My dream destination is Bora Bora and hopefully get to go there this lifetime but Santorini is by far the best beach/island experience I’ve ever had – YET. 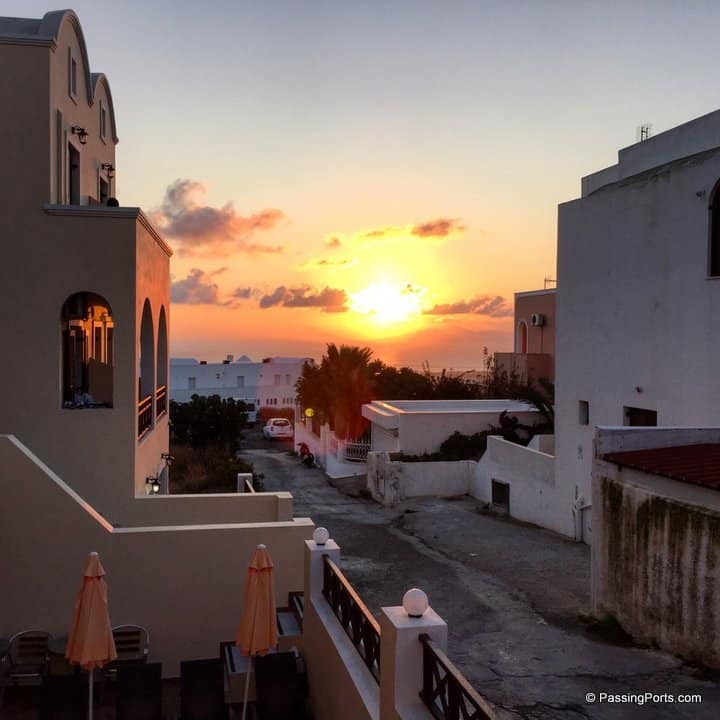 We landed at 640 AM in Thira, took our backpacks and headed out. There are buses which takes you to different areas of the island and we took the one to Fira. Once we got down, we walked our way to Hotel Villa Popi to check in. Right next to the property was this bike rental shop which opened at around 0800AM. You can rent scooters, bikes, ATV’s and cars from these rental shops. We took a scooter to vroom around this tiny island. We straight went to Oia, had breakfast and came back to our rooms to freshen up. We got ready in a giffy, took our scooter and headed North. There are a lot of coffee/bakery shops in this island and because the previous night was a no sleep night for us, we stopped for a coffee break. We were hooked to the Greekguide app by now to map the day plan. Vothonos was our initial stop as we spotted our first Windmill, clicked, clicked and clicked till we were bored and continued our exciting journey. We then rode up to the Holy Monastery of Prophet Elias Thira which is almost at one end of the island and gives you beautiful views of the Cyclades. Black Beach was our next destination which is also called as the Perissa Beach and the Perivolos Beach. The minute we reached here, I was bent upon spending the whole evening just sitting there and do nothing else. 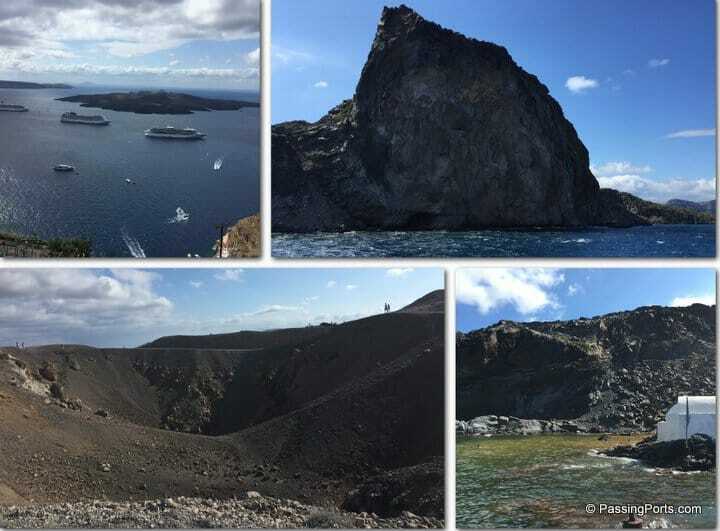 We had planned to visit two places only on day two – Nea Kameni which is a small volcano island next to Santorini and the Red beach in Akrotiri. 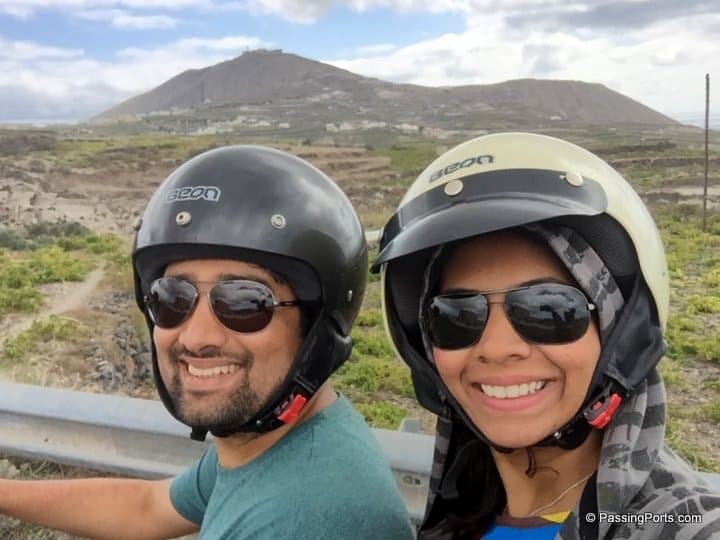 We stopped every few minutes to click away to glory, visited the Red beach and then drove back to eat in Senor Zorba – a Mexican restaurant as we were by now craving for spicy food. After a sumptuous lunch, we headed to the Old port. 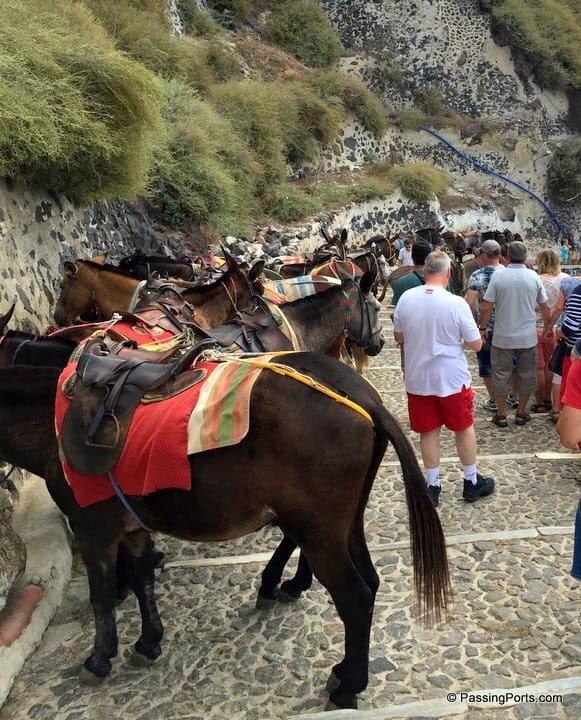 We climbed our way down to the Old port, wading through donkeys (you can rent them for going up/down for €5 one way). This takes a bit of time so make sure you are prepared. Once we reached the port, we took a package tour for three hours that takes you to the Hotsprings and and Nea Kameni Volcanic island. Tip: You can check with your hotel as well to buy these tickets. After the tour, we took the Teleferik (€5 one way pp) to reach Fira, and then took a bus to Oia for the sunset. This place gets really crowded for the sunset view, so go well in advance to catch your spot. We were a tad bit late, and also there were clouds which made the sunset blah! But once the lights were up, the city looked so pretty and my photos does no justice to its beauty. Next morning, we left to the new port by bus to catch the ferry to Mykonos. Our ferry was late by an hour and so we spent some time in a cafe at Santorini’s new port. Tip: Don’t go to Kalogeros Cafe as they never have WiFi which they claim works, and their food isn’t all that great. We were really excited to get on to the ferry which passes islands like Ios, Paros and Naxos. Don’t shy away from going up to the deck to catch a glimpse of these beautiful islands.